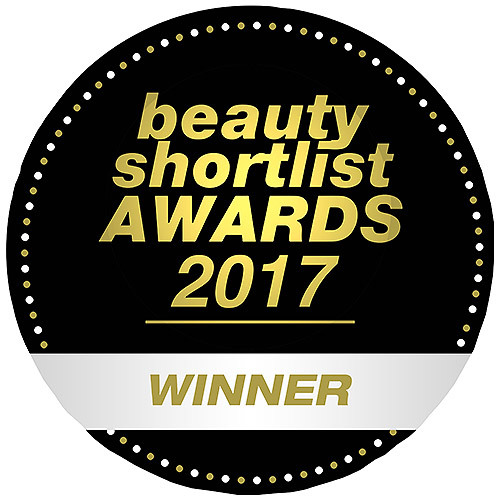 Winner of the Beauty Heaven Best In Beauty Awards 2014! 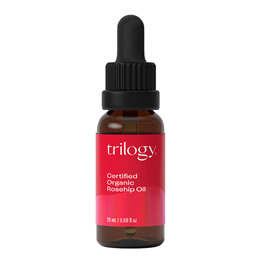 Trilogy Certified Organic Rosehip Oil is ideal for all over nourishment and repair. Rosehip oil`s potent natural actives make it highly effective for a variety of skin concerns including dehydrated and ageing skin. 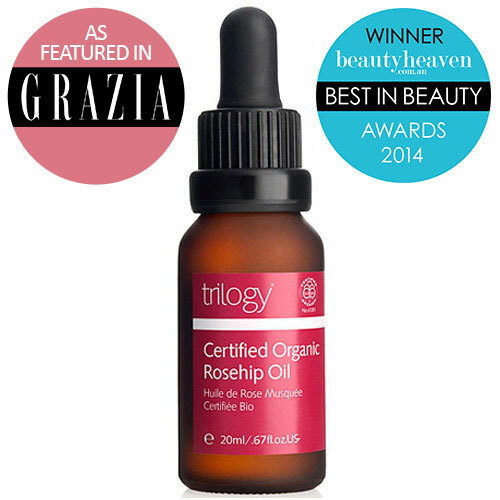 Trilogy Certified Organic Rosehip Oil - 20ml. Rosa canina (rose hip) seed oil. Free From: Parabens, artificial colours or fragrances, mineral oils, sulfates, detergents, synthetic fillers, lanolin, petrochemicals or propylene glycol. Below are reviews of Trilogy Certified Organic Rosehip Oil - 20ml by bodykind customers. If you have tried this product we'd love to hear what you think so please leave a review. Lovely product, good for my dry skin. Now my skin looks and feels amazing.Happy with delivery too. This Rosehip Oil is a deluxe product - face feels wonderful! Was sceptical before trying this but now I wouldn’t be without it. It’s helped my acne scars massively and has evened out my oily skin - 10/10. Light, absorbs, mixable with other creams if wanted. Feels nourishing both in the morning and evening and keeps your skin dewy feeling and supple, soft and moisturised still by morning. Love the natural subtle slightly nutty smell too but if wanted, lends itself to the addition of one drop of your favourite essential oil....especially lavender for night. I bought this primarily to use on the fine lines on my face. I was so looking forward to using this oil but the two times I used it on my face I had a severe reaction. One of my eyes went really bloodshot within 30 minutes of using it and then my eyes starting stinging and streaming. I'm not saying this isn't a good product because I'm sure it is, but it just does not suit me (well, my face anyway). I made sure I didn't put too much near my eyes so that wasn't the cause. Such a shame but it won't be wasted, I can use it on other parts of my body. Love rose facial products especially organic ones..This oil is one of the best Rose Hip oils ive used..Its fabulous !!! Totally pure and gives amazing results .. I use this at night. My skin is much smoother. Fine lines are fading. My oily skin is now having far fewer break outs. Fantastic. I love it because it is 100% organic rosehip oil. I was reticent about using face oils because I have ‘combination’ skin, but I wanted to ‘green up’ my cosmetics, and start using anti-ageing products. This rosehip oil does both - it’s ethically produced, and contains vitamin A, considered a bio-retinoid. I got this at a great price, it arrived promptly, was packaged sufficiently, and I wouldn’t hesitate to buy it again and recommend both it and Bodykind to others. This feels really good on my skin. I have skin that goes shiny throughout the day, but this is just hydrating - it does not make your skin more oily at all. It was a great price too, and I would definitely recommend it. This is the Rolls Royce of rosehip oils. I have been using it for 4 or 5 years now and the depth of pitting from acne scars on my cheeks has reduced so much some of my friends claim to no longer notice it. This is an amazing oil, it truly works. I have been using this oil for over a year now. It leaves my skin really soft, and certainly keeps the wrinkles at bay. Will be ordering more soon. Highly recommend. Top oil but need to reapply quite a few times! But very absorbant and makes skin glow. More please! Great product, soaks in well with no residual grease. Definitely makes my skin feel softer too. I highly recommend Triolgy Rosehip Oil, I'm 56 years old and started using this about a year ago after a recommendation. I have really noticed a difference to the elasticity of my skin, I use it daily, sometimes twice daily, but it is expensive, i use it on my face, lower arms and décolletage. My partner says he can tell the difference and said he is going to start using it. Before bed I use a couple of drops on each area and in the morning my skin feels really soft and has a nice clear glow. It is expensive with the amount I use BUT it's worth the money for how great my skin looks and feels. This oil is my desert island essential. It's fabulous and makes such a difference to my skin. I am in my late 40s so good skin is really important to me. My friends comment that I am looking younger and I feel better for using this oil. Not too keen on the smell but the results outweigh this. Only a couple of drops needed. I use it before moisturiser at night. Love it. I have used Trilogy Rosehip Oil for a few years and would not be without it. It nourishes my skin, leaving it smooth. Having combination skin I was unsure about trying this product but despite being an oil it's not actually greasy and instead leaves your skin feeling silky and plump. I really feel like it's made my skin more radiant and minimised dark circles. This oil has made a real difference to my perpetual dry skin. Just love it! Love this oil. Two drops enough for my whole face, it dont leave me greasy and i dont break out either. So happy to finally find something that works i can see the difference already yay! This stuff is amazing. I bought it to fade a scar after my mum had used it to fade a facial scar following surgery and was impressed. So was I. It worked on the scar and I have also used it on dry skin, as a cuticle oil, on sunburnt skin as well as mixed it was aqueous cream and a body lotion (add tea tree oil too and it's a great after waxing treatment.) Oh and in winter it's a great facial oil to boost skin dried out by the elements. It's a regular beauty product in my bathroom cabinet now, lasts ages and I always recommend it to friends. Amazing product...would definately recommend it. Have been using this religiuosly at night for the last few months and my skin looks amazing...plump and healthly. This is a great oil. I noticed an almost instant improvement in my skin tone within a week of using this and the results got better over time. Its a must if you have a dry and uneven skin and this also helped with my hormonal breakouts and also lasts for ever. Great value for money with great results. This product was recommended to me and it is definitely worth it! It's full of natural ingredients and after 2 weeks I have definitely noticed a difference. My skin feels healthy and has a lovely glow to it. I have received a lot f compliments. Definitely worth trying!!!! Truly impressed at how well it's calmed my reddened, rosacea type, irritated facial skin.